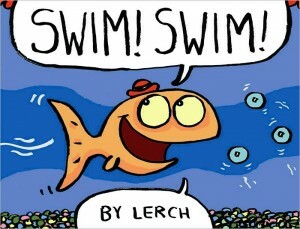 Lerch the goldfish wants a friend, which is difficult since he's the only fish in his tank. Undaunted, he swims around his tank, talking to the gravel, the plastic undersea diver, and the bubbles, though sadly none of them answer him. Just when he thinks he's as lonely as a fish can be (in a wonderfully empty two-page spread), a cat arrives outside the tank and talks to Lerch. But, uh-oh, he calls him Lunch. Fear not, though, as young readers and storytime audiences will be greatly relieved by the final, friendly twist to the story. Though Lerch gets the credit for this picture book, James Proimos is responsible for the art and story. 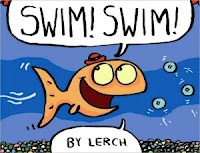 He uses the comic-book format, with panels and word balloons, to great effect here; Lerch's repeated “Swim! Swim!” can be a nice storytime chant. The bright colors and clear art match the simple story and will attract the youngest read-to-me set.